The harp adds that special touch to your big day! 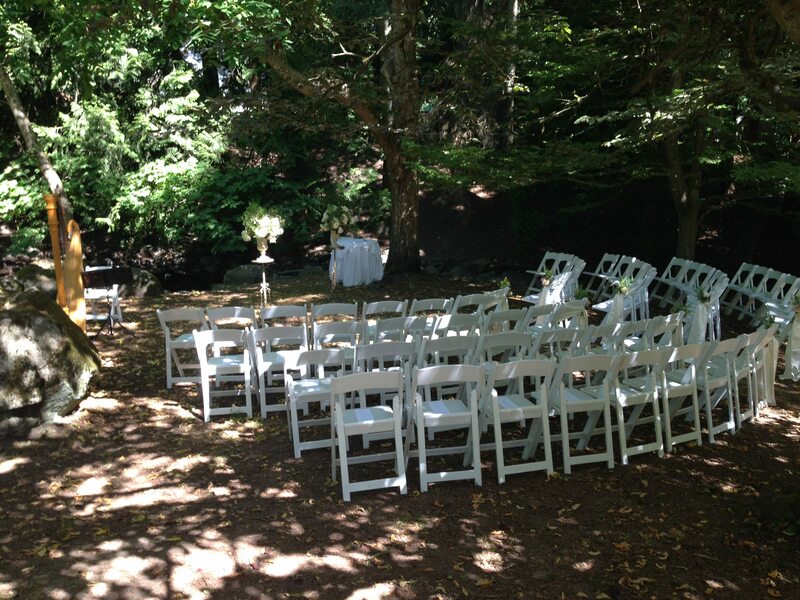 Your wedding day is one of the most momentous occasions of your life. Let me help you make it unique and beautiful with the memorable music of the harp. 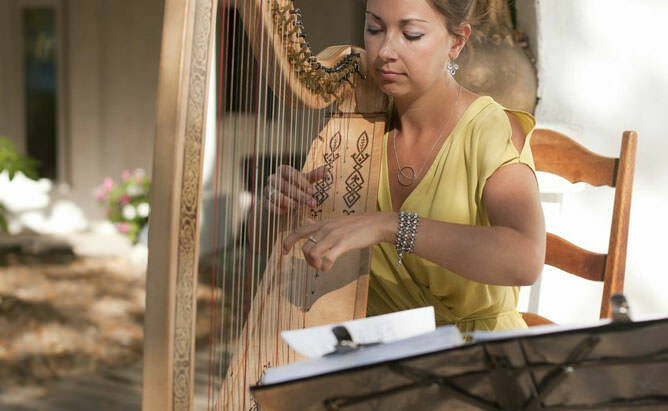 The romantic music of the harp sets the mood for your ceremony, ensuring it will be unforgettable and exceptional. I bring musicianship, experience, expertise and professionalism and I would love to play at your ceremony and enhance your beautiful celebration. Some couples decide to go with prerecorded music for their big day but it pales in comparison to the soul, artistry and unique touch of a live performer. For more than a decade, I have set the tone for brides as they’ve walked down the aisle, holding back tears, seeing their supportive family, friends and handsome fiancé waiting. During such an intimate moment, I truly feel that the harp is the perfect compliment. 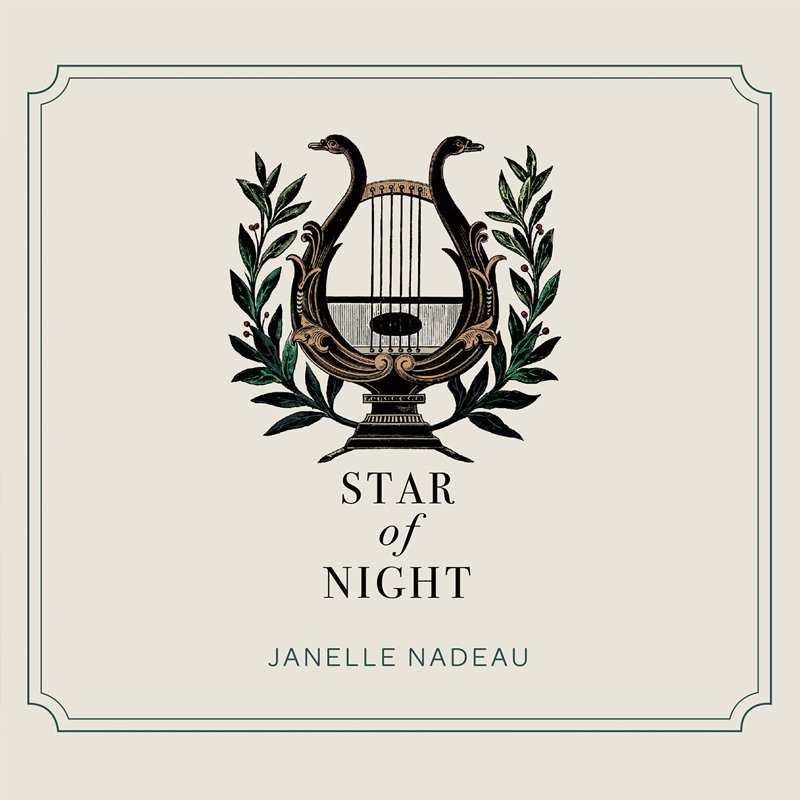 Each couple makes their wedding unique by selecting their songs and I help my couples find exactly what it is they are looking for. We discuss direction and choices so that it is perfect for you. Give each other the gift of live music on your special day. I play music as your guests arrive BEFORE THE CEREMONY, which is usually around half an hour before the ceremony officially starts. This sets the tone for the ceremony. Generally, my cue that the wedding party is ready to start is when the groomsmen move to the front. From there, I play a song for the BRIDESMAIDS, the ring-bearer and flower girl. Then comes the beautiful moment when the BRIDE walks down the aisle to marry the love of her life. I usually change songs for her unless she requests that I keep playing the same song as for the bridesmaids. The SIGNING OF THE REGISTRY is the next musical component of the ceremony. This is a special moment as it is when everything becomes official! Once the newly married couple is announced, it is time for THE RECESSIONAL. This is usually an upbeat and happy song. I usually play another piece or two as the guests move from the ceremony area to wrap it all up! Some couples like to have the elegant feeling that the harp provides continue into the cocktail hour or reception. If I play during the reception, I usually play as the guests arrive to the reception and the dinner. With all the other choices out there, why choose me? With my many years of training and my wide range of professional experience, I can play most any style of music. I am reliable and I make a point to get back to my clients promptly. Yes, of course! The only thing is that the harp needs to be on a flat surface and if there is any sort of precipitation (which has only happened once! ), moving the harp to a covered area is required. The harp is made of wood and metal so there are no exceptions. 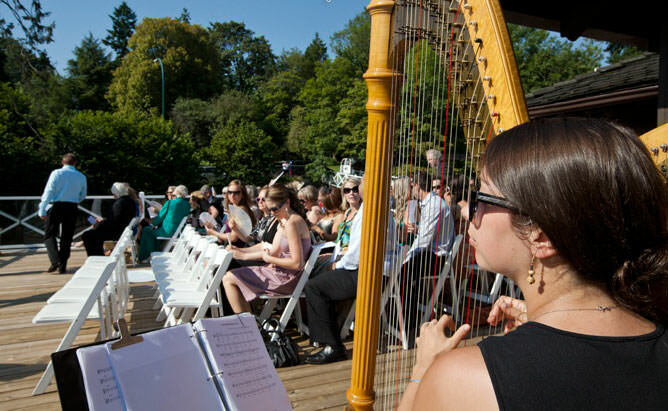 I cannot play in direct sunlight as it is bad for the harp and the sun makes the harp go out of tune so quickly that by the ceremony, the harp would sound a bit unharmonious! How do I pick songs? Once the couple has contacted me, I send a list of songs to choose from. Some couples know exactly what they want in the song choice while others need help with direction. We can discuss this as much as you want until you feel comfortable. The short answer: anything! As long as it can be played on the harp, I am more than happy to play it for you! I am happy to play modern hits to classical and everything in between. Can you learn new songs that are not on your list? Yes. If there is a song that you would really like for your wedding, we can discuss it to figure out if it will work. Which harp do you bring? As you may have noticed, I have a few instruments. You have the choice between the Celtic harp or the larger classical harp, whichever suits your preference. Will my guests be able to hear the harp? Generally the harp is heard just fine without the help of any external amplification. However, if you are concerned, we can always discuss the size of the congregation and ceremony space to determine if an amplifier system is required. To further inquire, please refer to my contact page or the contact information at the bottom of this page. I look forward to hearing from you. Thank you for your interest, and most of all, CONGRATULATIONS!